Published: Dec. 20, 2013 at 12:16 p.m. Updated: Dec. 20, 2013 at 03:25 p.m.
Carson Palmer's still figuring out how Christmas works. Cardinals kicker Jay Feely let us in on a situation in Arizona, where the team's starting quarterback is witholding his holiday cheer. 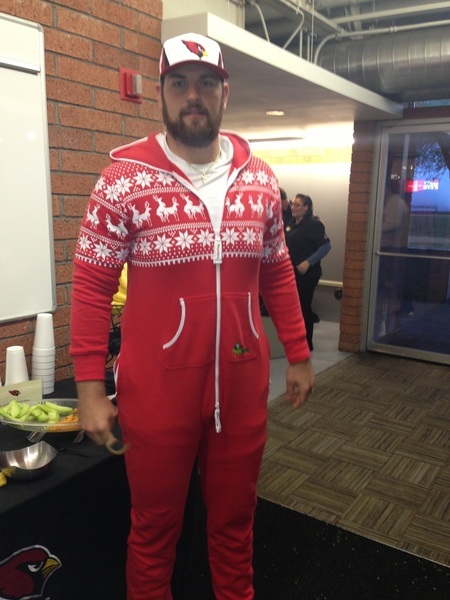 "To get their Christmas gift from Carson Palmer," Feely tweeted, "the oline have to wear his hand picked outfits all day...awesome." Decidedly not awesome for this fellow, waltzing around the team complex in a onesie better suited for a behemoth forest toddler. We are begging Cardinals personnel to send us more visual evidence of this fashion lowpoint unfolding in the desert.